The Ace of Cups show us that potential is in abundance, but how this will formulate and manifest itself is still unknown. In this card we are confronted with the element of water. 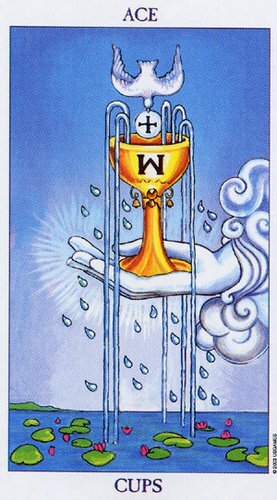 This however is a card that illustrates the element of water in its primordial form. Emotions & intuition in their primitive form. Water as the emblem of the unconscious. In Christianity, the Spirit of God moves over the impenetrable depths of the waters, before creating life. The chalice represents the womb from which all creation is born. Yet, in the act of creation, the power of water has yet to be reacted upon by outside forces. 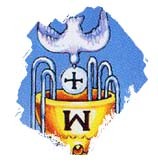 Historically cups are associated with the church and love. Cups receive the impulse and respond to it. Cups represents love, relationships and imagination. Cups can open you to your inner feelings and the connections you have with others. Choices on this level seem intuitive. As an image of the unconscious, this card shows the need for evolution of consciousness. For, this process is necessary in order for individuation to occur. The Ace of Cups demonstrates that the unconscious must interact with the conscious mind before it can create. This card shows a period in which great potential exists, but no direction or fertilization is yet apparent. If the seeds of wisdom sown are the sound seeds of personal discovery, then the harvest will be rewarding and fulfilling. 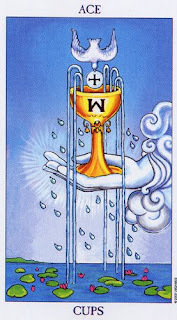 Imagery in this card includes an equal-armed cross, suspended above a large golden cup. In their book “The Secret Language of Tarot,” my tarot mentors Ruth Ann & Wald Amberstone describe the cross as a symbol of distilled human consciousness, being a symbol that is born of the human mind rather than directly from nature. They continue to say that crossroads are places where all important decisions are made! Cross-examinations reveal hidden personal truths and motives. Strangers become friends when their paths cross. Crossing the ocean is as far as one can physically travel. And crossing swords is a joining in battle. Double crossing is the essence of treachery. When the cross is tilted it becomes an X. An X in a ballot signifies a choice that has to be made. An X on a signature line is the universal sign of human identity. And X marks the spot on every map of buried treasure! The cross is the symbol of all that changes and all that remains the same. It is the relationship between the stable state of things, represented by the horizontal line, and the dynamic state of things as they might become, represented by the vertical. It is the symbol of the creative potential of absolute difference. In an equal-armed cross stability is suggested as all arms have equal length – thus significance. It is the sum total of all there is, and it’s a universal symbol of serenity. The cross reveals dimensions, offers fresh perspectives, and opens a whole new possibility for creativity, personal refinement and spiritual elevation. Most important about the equal-armed cross is that each of the four arms are equal. North is as good as south, winter as good as spring, old-age serves as great a purpose as childhood. Pain and pleasure, fullness and emptiness, even life and death are equal. A hard lesson to learn, but it’s the one that brings serenity and balance into our lives. In closing we might ask ourselves what potential lies dormant within that is ready to emerge? How can we uncover our creative potential and thereby manifest serenity and balance in our lives? What aspects of our lives are in need of equality? Do we acknowledge the lessons of our pain as we revere the joys of our pleasure?